Books can come to you when you least expect but most need them. 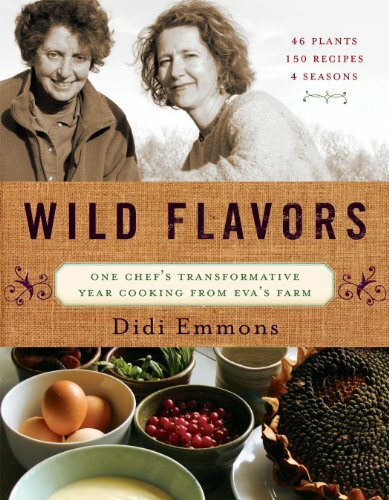 Such is the case with Wild Flavors: One Chef’s Transformative Year Cooking from Eva’s Farm by Didi Emmons. Ms. Emmons is a chef and Eva is the renowned farmer Eva Sommaripa, who has been providing many of the finest Northeastern chefs with greens, herbs, and edible weeds—more than 200 from which to choose—for more than three decades. When Chef Emmons first visited Eva’s Farm in Massachusetts, she tasted such delights as an herb that tasted like basil and mulled cider and a red fern that tasted like licorice. Overwhelmed by the variety, she returned regularly and began cooking in Eva’s kitchen, using the greens and herbs she’d just picked. The two women became friends; and it didn’t take Emmons long to realize that Eva had a special wisdom about plants. My dad has this wisdom about plants, too. He would have loved this book—one of the reasons I do. Along with that wisdom, he had a profound respect for food, something that both women quickly exhibit in Wild Flavors. Other reasons to love this book is its emphasis on conservation and the importance of not wasting, as well as the stories and profiles of people who know that growing good food is hard work—and that eating it is a privilege. The practicalities in Wild Flavors are interesting, too. Chef Emmons suggests kitchen aids that both she and Eva like: a pressure cooker (which cooks faster and retains more flavor), Vitamix blender (with a motor so strong that it can pulverize practically anything), mandolin (for slicing vegetables), and a dehydrator (for preserving). The book is divided into seasons, each with a season-related focus: salvaging in winter, community in spring, bartering in summer, and preserving and conserving in fall. There are tips on buying and growing food, storing and preparing it, information about the health benefits of certain foods, and a lot of recipes. The recipes—written in a clear and easy to follow manner—are varied and interesting. Some I have made—“Mo’s Jeweled Rutabaga-Beet Soup” and “Gingered Tofu in Beet Broth”—both of which were delicious and satisfying, especially on rainy days. There is an enthusiasm in the writing and in the telling of stories, even in the short piece on building community using an old-fashioned Rolodex. Those who refuse to give up this ancient precursor to handheld high-tech address storage devices will find this a particular delight to read. Food brings people together, as Wild Flavors: One Chef’s Transformative Year Cooking from Eva’s Farm demonstrates. It is a lesson I learned early, watching my dad plant and tend his large backyard garden—with over-the-fence contributions of neighbors and friends—and seeing his pleasure in bringing his food to other tables, not just his own. My copy of Wild Flavors is so dog-eared that the book looks like I’ve owned and used it for years. I haven’t—but I intend to. Sharon Hunt is a freelance writer and book reviewer whose work has been appeared in national and regional Canadian newspapers. Her food writing has appeared in Edible Toronto and Shambhala Sun magazines. She has worked for one of Canada’s premier culinary training institutes and is currently writing a memoir of growing up in the shadow of superb family cooks.